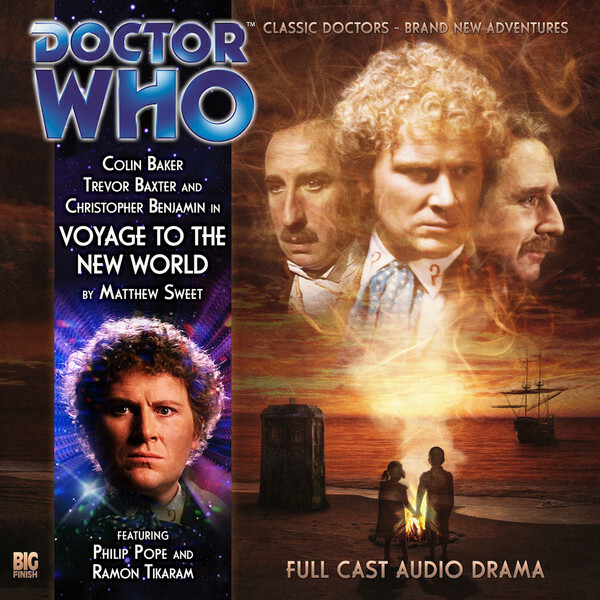 Big Finish: Doctor Who - VOYAGE TO VENUS & VOYAGE TO THE NEW WOLRD Review | Warped Factor - Words in the Key of Geek. One voyage is not enough for Tony Fyler. Big Finish titled a recent trilogy of releases the ‘Locum Doctors’ sequence, because it paired established companions with the ‘wrong’ Doctors. But it’s an idea they’ve been toying with for a long while – and never more successfully than with the Sixth Doctor. He’s met Victoria Waterfield, Jamie McCrimon, Zoe Herriot and, arguably most successfully, those Victorian virtuosos of criminal confoundation, Professor George Litefoot and Henry Gordon Jago. The two special releases, Voyage To Venus and Voyage To The New World, which team Old Sixie up with Jago and Litefoot, sit between Series 4 and 5 of the pair’s own adventures, and they couldn’t be more different from each other in tone, but they certainly deliver the idea that the Doctor and the two Victorians would be a good match in any incarnation, and that like his other franchise-building friends – Sarah-Jane, Captain Jack and Iris Wildthyme, Jago and Litefoot are more than capable of holding their own when faced with the broader universe than ‘ordinary’ Victorian London. 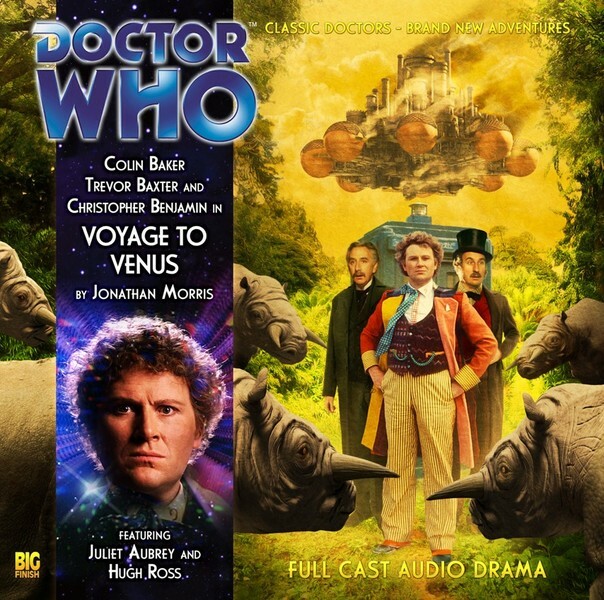 Voyage To Venus wears all its influences about as proudly and boldy on its sleeve as the Sixth Doctor does his coat of warring colours. There’s Jules Verne, there’s HG Wells, there’s a bit of Edgar Rice Burroughs, a smidgen of Olaf Stapledon, and if you squint hard enough at the script, there’s even a bit of Douglas Adams in there. The story is a delicious mish-mash, and of the two, it’s by far the lighter and more fun. The Venusians (all of whom are women bar weak tiny mates the size of pomegranates) live in cloud-cities which belch out gases, and they’re investigating a spurt of new life on the surface of the planet when the three adventurers come calling. Venusian society is summed up economically in the person of three characters – Vulpina, the Empress, Felina, the soldier, and Ursina the scientist (a lovely touch of linguistic pretension in the naming conventions from writer Jonathan Morris there, given the story focuses on new species and life-forms). Litefoot and Jago each find a way to survive, using their particular personalities to get by in the wider universe, and ultimately both being crucial to the unraveling of what’s going on on Venus, and to stopping it. The plot has a beautiful circularity, covering hunting, planet-sharing, group vs individual minds, autocratic power, the scientific search for truth, and why it’s a bad idea to trust politicians, all while proving that everything you think at first is wrong, and between the Venusians and the Cytherians (no, no spoilers), there are some great touches, tying in to more than one mystery from the Jon Pertwee era. Vocally, there’s a slightly odd sense of knowing the cast here, because some of them sound incredibly like longstanding Who characters or actors – Charlie Norfolk as Ursina is vocally a dead ringer for Eleventh Doctor Christmas Special star Claire Skinner, while the ubiquitous Hugh Ross here turns in a performance as Vepaja of the Cytherians that get you wondering ‘Is that Michael Troughton?’ Overall, there’s a distinct Pertwee riff throughout the story, especially in terms of its central dilemma – the peaceful, or antagonistic, co-existence of two sentient species in the same environment. Voyage To the New World is darker by about twenty shades, taking the Victorians to the dawn of American civilization, and delivering a spooky tale of ghost children, people kept eternally prisoner, terrible prices to be paid for crimes of the past and darkly convoluted solutions to the central dilemma. In a way, it’s the flipside of Voyage To Venus, dealing with the same themes, but from an altogether grimmer angle – the idea of co-existence within the same environment is key to Matthew Sweet’s New World script too, but here we’re in the territory of humans and bacteria to some extent, a kind of symbiotic relationship that can’t be broken, and yet must if there’s to be a happy ending. It’s more human, and complex, and altogether intense than such simple biological solutions though; it brings a kind of time-twisting, timeline-evaporating logic into play to resolve itself, and centres on the person of a historical figure who has a very different destiny in mind to the one with which they end up – as arguably, do most of us. What that by necessity means is that whereas Voyage To Venus allows Jago & Litefoot their individual pathways through the story based on their particular strengths of character, Voyage To the New World gives Colin Baker’s Sixth Doctor the opportunity to show his analytical strengths and his compassion, as the detective who works out the sad solution to the story. Of special note in the second of the Voyages, listen out for Ramon Tikaram as Wanchese and Seasoned Big Finisher Philip Pope as John White – one of the more emotionally complicated characters in the piece. Mark Lockyer too delivers something fairly deep and memorable, in a role that must have been tricky to cast, and leaves you thinking. The two Voyages together are very much a companion set (pardon what was barely a pun), and they allow Jago & Litefoot to venture further afield than the London of their usual adventures, preparing them for the ending of Voyage To The New World. That ending sets the Victorians up for what promises to be their most bizarre series of adventures yet, deprived of all the comforts not only of their home, but of their time. How will Jago & Litefoot get on in Season 5, away from Sergeant Quick, the ever-reliable Ellie and the comforts of the Red Tavern?